Sara Blackburn is a recipe developer and the creator of the food blog Real Balanced. 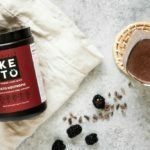 This Nootropic Berry Chocolate Protein Smoothie is full of energizing and satiating fats, protein, exogenous ketones, and Perfect Keto Nootropic. Plus, blackberries are packed with antioxidant-rich vitamin C — perfect for tissue repair and immune function. Easy and quick to prepare, this adaptogenic protein shake is perfect to enjoy pre-workout or after you sweat. Nootropics, aka smart drugs, are natural and synthetic compounds that enhance mental functions like mood, focus, memory, motivation, and attention span[*]. Nootropics can consist of any number of compounds, from man-made synthetics, to herbs, to amino acids. Perfect Keto Nootropic contains an array of herbs, exogenous ketones, and other compounds that provide brain support. Phosphatidylserine (PS), for instance, is a crucial phospholipid found in every single cell in your body. There are millions of cells in your brain alone, so it makes sense that phosphatidylserine helps to maintain healthy brain function. Without proper nutrition and stress reduction, brain degeneration happens naturally with aging. This can result in short- and long-term memory loss, confusion, and the inability to perform simple daily tasks as you age. Phosphatidylserine may help prevent or reverse that by crossing the blood-brain barrier to either slow or completely stop any deterioration from happening[*][*]. Ginkgo biloba, another prominent ingredient in Perfect Keto Nootropic, acts as an anti-inflammatory and helps fight free radicals and improve circulation. Ginkgo biloba may also help improve cognitive ability by promoting cerebral oxygen supply and blood flow[*][*]. If you’ve heard of fish oil, then you may have heard of DHA (or docosahexaenoic acid), which is a polyunsaturated omega-3 fatty acid crucial for brain health. DHA boosts memory and brain function and may improve “brain plasticity” — your brain’s ability to adapt and rewire synapses. That means more and better communication between your brain cells, aka better memory and overall cognitioon[*]. Alpha lipoic acid (ALA) is an antioxidant and naturally-occurring lipid that supports and regulates cell function. It helps fight and prevent oxidative stress and reduce inflammation[*]. ALA is also known for improving insulin sensitivity, lowering your blood sugar, and regulating cortisol output, all of which help address inflammation and metabolic function. This is crucial for overall physical and mental health[*]. Cat’s claw also supports cellular function because of its antioxidant and anti-inflammatory properties[*]. One study in healthy adults found a significant decrease in DNA damage and an increase in DNA repair in participants who took 250-350 mg of cat’s claw extract over a period of 8 weeks. This was compared to the control group who didn’t take a supplement[*]. L-theanine is a calming amino acid that works without making you feel sluggish or drowsy[*]. There are plenty of studies on the benefits of L-theanine but this calming compound is most well-known for its ability to reduce stress, anxiety, and nervousness[*][*][*]. Increasing your intake of L-theanine can decrease anxiety and symptoms associated with other mood disorders. Keeping your stress hormones in check is great for your brain, which is why you’ll find L-theanine in many nootropic blends. This particular recipe calls for a chocolate protein powder of your choice. Grass-fed whey protein isolate is a great option. If you have a dairy allergy or extreme lactose intolerance, try a high-quality grass-fed beef protein isolate or vegan protein powder. Both are keto-friendly and will provide you with an array of amino acids to help support muscle growth and recovery. If you’re in the mood for a rich chocolate, low-carb smoothie, this is the one to try. Plus, you’ll get the brain-boosting effects of exogenous ketones, powdered MCT, and powerful adaptogenic herbs. Enjoy! Get ready for an adaptogenic chocolate protein smoothie that will satisfy all your cravings and give you the energy you need to crush the day. Add all ingredients to a high-speed blender and blend until smooth.